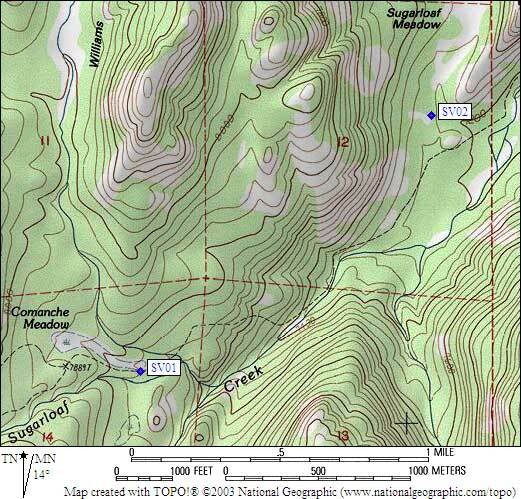 Last box is SV02: Sugarloaf Meadow. Next box is SV02: Sugarloaf Meadow. GPS Waypoints in Region SV	: simple Waypoint+ format, download GPX file, or overlay on interactive map. 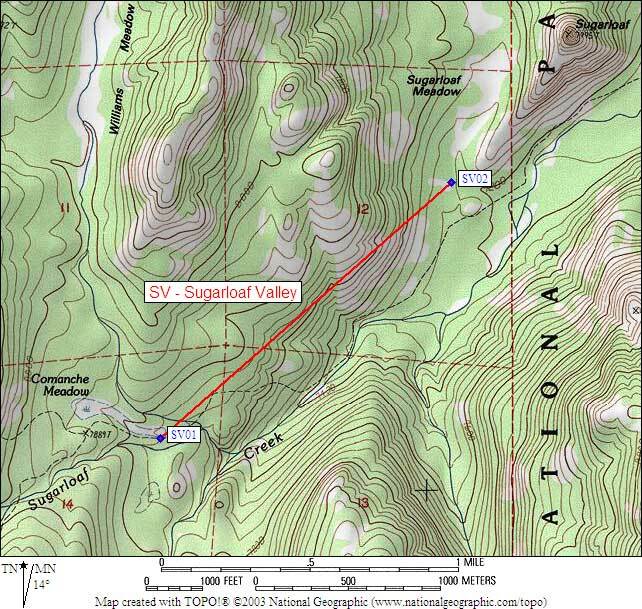 SV01 is a standard box, at about 7800 feet, in the GPS route SUGARLOAF VALLEY. One box on the south side of the trail (a bearbox signpost existed in 1999 but was missing in 2003) between the trail junction that gives you two choices to Rowell Meadow and the stream crossing just west of where the trail drops to the Sugarloaf River. The campsite is in fairly tall trees, one of the few areas NOT primarily pines, at the low end of a meadow. Water is nearby and this site doesn't seem to be used by horse packers. (lat,lon) = (36.7108000, -118.6836800) in decimal degrees, NAD83. (zone,east,north) = (11S, 349701.0, 4063914.0) in decimal meters, NAD27. Scroll down for a regional map of the entire Sugarloaf Valley region.